I've said it before, but now I have the means to do it. 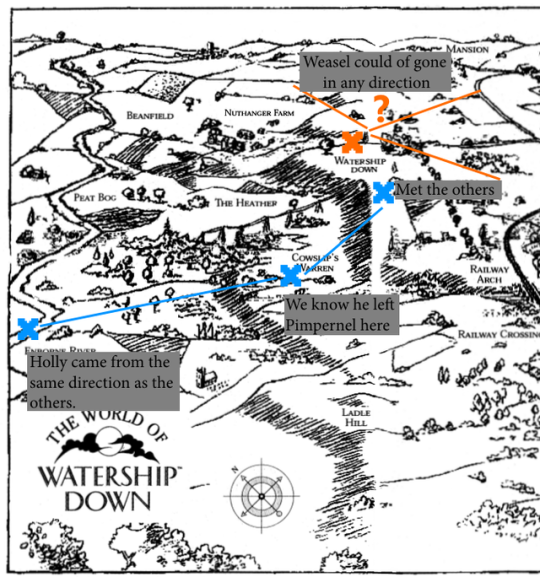 Lets build a map of the Watership World, as accurately as we can! I have a few maps of the Down and I'm currently placing markers where I think each episode took place, using what evidence there is. If I carried on like this, it would look messy, so I'm thinking doing it episode by episode? What do you think? I'll share the blank versions after it's done! They are definitely off the map! Sorry it's been so long, you are so patient! I'm slow but I haven't forgotten about this project. 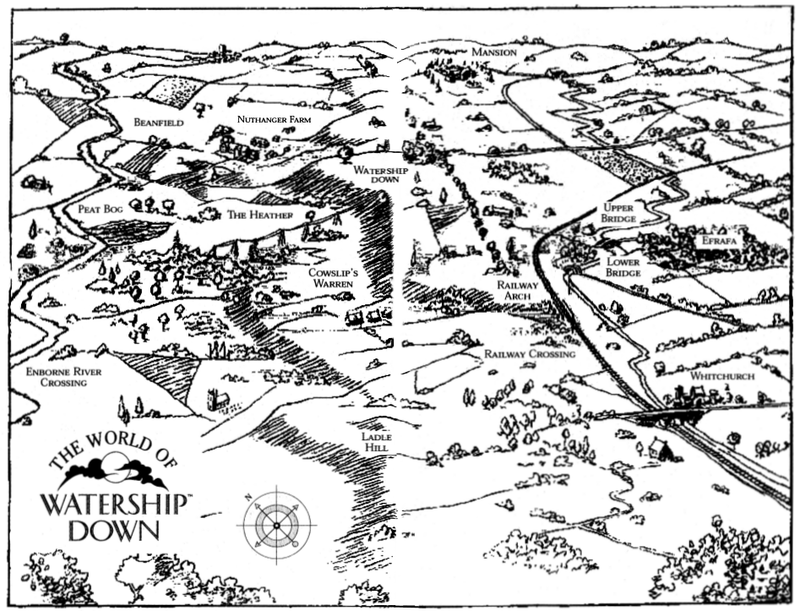 Here is (the best one I could get without destroying a book) the map of the Watership World, Series wise. I have the coloured map from the series opening, but overall this gives a wider, better view. Finer details are missing, but its good for a general overview. I tried my best to make it look pretty, but instead I went for practical. 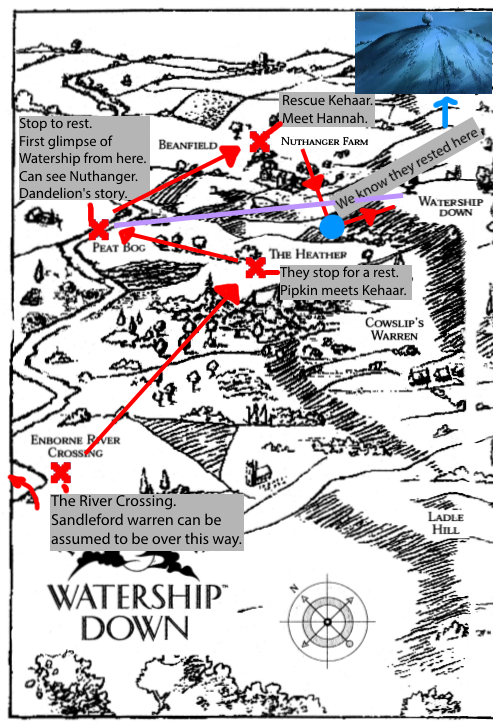 x From the Peat Bog they have their first look at Watership, this is what the purple line indicates. x The blue dot is where they start the climb. x Holly came from Sandleford, so from the same direction as the others. x His journey was probably more like a sqiuggly line, but a general idea is best. x The weasel went to "the far side of the down," no indication to what direction that was, so it could be anywhere. Tell me if these images are OK / easy to read!! You did a great job with these maps, I think They seem accurate, and I didn't have any problems reading them. Where did you get the original map, though? It wasn't in the magazine scans you posted. Also the "mansion" at the top of the image, I assume that's where Buttercup's warren is? The scan is from one of the longer stores by Judy Allen? Their still meant for kids but their harder to read for them. I have a full colour map that was used in the series openings from one of the foreign dvd covers. I don't have anything to hand at the moment since I'm at university!! I'll get to finish these soon though. Great work on these! Certainly takes some thinking. For the direction the weasel went in: for some reason "the far side of the down" made me think he headed in the direction of the mansion but I don't really have a concrete reason for thinking this. I think so, too. Since it was never mentioned to go near Efrafa or Cowslips Warren. Hmm. I’m not sure what happened with the weasel after The Vision. 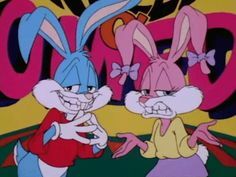 Did Bigwig and those other rabbits kill him?